Everybody Hates Chris last episode? 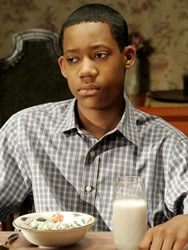 The Everybody Hates Chris sitcom has been running for four years; one on the UPN network and for three on the CW. Loosely based on the early life of comedian Chris Rock, the sitcom stars Tyler James Williams, Terry Crews, Tequan Richmond, Tichina Arnold, Imani Hakim, and Vincent Martella. Recurring characters are played by Jacqueline Mazarella, Travis T. Flory, Kevontay Jackson, Ernest Thomas, Jeris Poindexter, Jackee Harry, Michael Estime, Antonio Fargas, Blake Hightower, and Todd Bridges. Last night, the CW aired episode 88 of Everybody Hates Chris, titled “Everybody Hates the G.E.D.” It’s the end of the school year for our young hero and he’s late (by mere seconds) for the 29th time. Though he’s already finished his tests and it’s the last week of school, he’s told that if he’s tardy one more time, he’ll have to repeat the 10th grade. Meanwhile, Drew decides he wants to audition for Amateur Night at the Apollo, despite not having any particular talent. A full house at the barber shop tells him about their own personal experiences performing crazy acts and getting booed off the stage. As you might guess, Chris ends up being late for school for the 30th time, even though it’s hardly his fault. He’s told he has to repeat the school year and his Mom agrees with the school because, in the long run, she feels it’s the best thing for his character development. Chris refuses to repeat the year so he decides to drop out of school. His parents are not happy. So that he’ll be able to get a job, Chris decides to take the G.E.D. test so he can have the equivalent of a high school diploma. By the end of the episode, Drew has performed a pail drumming act and, thanks to some assistance from a hot dancer, it goes over very well. Tonya graduates and Chris has taken his exam. Would you like to see season five of Chris? Yes! I want to see what happens! He waits for the results at the local diner and one by one, his Mom and siblings arrives. Chris plays “Living on a Prayer” on the booth’s jukebox and his family sings along with him. His father, who has some trouble parking the newspaper truck, has the results of his test. Just as Chris is about to discover his fate, the screen goes to black. With appearances by many of the show’s recurring characters, Chris dropping out of school and the not-so-subtle homage to the finale of The Sopranos, Chris Rock intends this to be the series finale. The show is very likely to be cancelled due to a variety of reasons and the comedian decided to make it an easy decision for the network. The network will ultimately decide if last night’s episode is the last but, if it is, do you think it’s a good series finale? Are you okay that it ended in a cliffhanger? If not, how would you have finish the show?